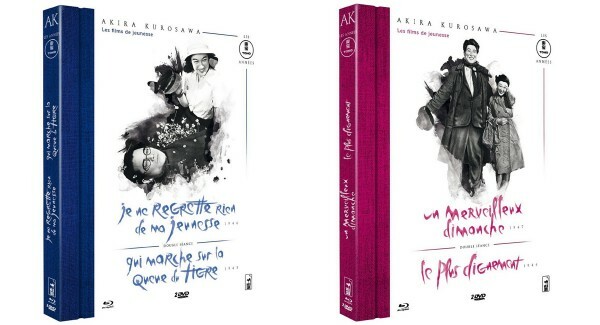 French speakers have much reason to rejoice, for Wild Side Video will be releasing four early Akira Kurosawa films this autumn. The films, included on two double feature Blu-ray + DVD releases, are No Regrets for Our Youth (Je ne regrette rien de ma jeunesse) and The Men Who Tread on the Tiger’s Tail (Qui marche sur la queue du tigre) on the blue-spine set, and One Wonderful Sunday (Un merveilleux dimanche) and The Most Beautiful (Le plus dignement) on the rose coloured one. The release date for both sets is October 28, 2015. As a double format release, both sets include the films on Blu-ray (one disc) and DVD (two discs). The films are presented in original Japanese (DTS and Dolby Digital), with French subtitles. No on-disc extras appear to be included, as is more or less expected for these early films. Both sets do however contain a booklet that includes information, photos and archival documents about the films. There is no specific information about the source of the transfers, but it is probably safe to assume that they come from Toho’s Blu-ray releases. Both sets are available for preorder from many online shops, including Amazon.fr (see here and here). Wild Side Video has a long history of Kurosawa releases in France, with their Seven Samurai (see Amazon.fr) the most recent release. Why is it that the French so often have such wonderful cover designs for their releases?